UNC Asheville women’s golf prepares for the Big South Championship led by their new head coach. Occupy the Quad, a collective of students, come together to express their disappointment and dissatisfaction with how UNC Asheville has handled Title IX cases, diversity, health and counseling, among other such things and administration gives their response. Students gather for the Study Abroad Photo Contest reception at Blowers Gallery in Ramsey Library. Poor membership retention, accountability and attendance created challenges in the Davis-Anderson administration, according to Student Government Association Vice President Kimani Anderson and Legislative Librarian Jackson Myers. Students were encouraged to take time out of their day to plant acorns that would eventually turn into beautiful oak trees. White oak and red maple saplings will be given to those supporting alumni who contributed to UNCA’s Pisgah Scholars Program. 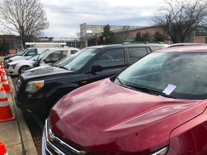 UNC Asheville’s students and staff complain about the struggle to find convenient parking on campus.